The P2RX7 gene (coding for P2X7 purinergic receptor) has been suggested as a novel candidate gene for major depressive disorder (MDD) and bipolar disorder (BPD). The proposed risk allele (G-allele) of the rs2230912 polymorphism results in an amino acid change at the 460th position, marking this genetic variation a possibly functional one. Here we present a case–control analysis of 171 patients diagnosed with MDD or BPD and 178 controls, as well as a dimensional approach using the Hospital Anxiety and Depression Scale (HADS) for studying the Gln460Arg polymorphism of the P2RX7 gene as a genetic risk factor in depression. While case–control analysis did not show significant difference between the groups, a significant association was found between the P2RX7 polymorphism and the HADS scales in the clinical group (MANOVA P = 0.001). Both anxiety and depression scores increased as the number of G-allele increased in the genotype groups (ANOVA for HADS-anxiety: P = 0.01, HADS-depression: P < 0.001). A significant interaction of clinical status and the P2RX7 polymorphism was also found for the depression scale (MANOVA P = 0.025, subsequent ANOVA for anxiety: P = 0.252; depression: P = 0.002). Whereas patients with G-allele-present genotypes showed more elevated depression scores, level of depression in the control group was not affected by the P2RX7 genotype. In conclusion, case–control analysis did not reveal significant results, but using a symptom severity scale we could support the association between depressive disorder and the G-allele of the Gln460Arg polymorphism in the P2RX7 gene. 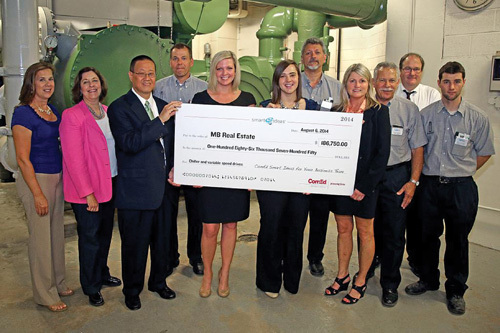 © 2008 Wiley-Liss, Inc.
CHICAGO, Ill. – MB Real Estate is pleased to announce that 181 W. Madison has recently received a $186,750 rebate check from ComEd for its participation in the Smart Ideas® Building Performance with ENERGY STAR® Commercial Real Estate program. The program provided by ComEd is designed to help multi-tenant office buildings become more energy efficient, overcome the barriers often preventing owners and tenants from investing in energy efficiency, and offers technical assistance to commercial building owners and tenants to take advantage of available incentives. Energy is one of the largest operating expenses for office buildings and ComEd’s Smart Ideas® program helps buildings offset the capital investment needed for energy reducing projects. For their part in the program, MB Real Estate’s management and engineering teams at 181 W. Madison recently completed a chiller replacement. The project involved replacing an existing 23-year old 1,100 ton chiller with a new energy efficient 1,350 ton chiller. The new chiller will result in a decrease of more than 200,000 kwh/year, or roughly an annual savings of $20,000 with another $7,000 in savings due to a reduction in the maintenance contract. Additionally, the rebate from ComEd has reduced the overall cost of the project by 21%. 181 W. Madison is a Class A, 50-story office building located at the intersection of Madison and Wells in Chicago’s Loop. The property is owned by CBRE Global Investors and is leased and managed by MB Real Estate. Posted by FanningCommunications on Sep 1st, 2014 and filed under News. You can follow any responses to this entry through the RSS 2.0. Both comments and pings are currently closed.